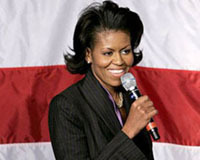 First Lady Joins “We Day” Broadcast | Broadcast Public Service: Local Stations. Big Impact. ABC stations aired the “We Day” program commercial-free on August 21. “We Day” aimed to encourage families to discuss issues such as bullying, body image, the environment, violence and literacy. First Lady Michelle Obama encourages American youth to make a difference in their communities this school year.The cast also included Selena Gomez, Jennifer Hudson, Common, Tyrese Gibson, Nick Jonas, Demi Lovato, Jennifer Aniston, The Band Perry, Earvin “Magic” Johnson, Paul Rudd, Colbie Caillat, Kenny “Babyface” Edmonds, Macklemore and Lupe Fiasco.